Integrated circuits like those that Sigenics designs are meant to house as much information processing capability in the smallest space possible. A common IC size is 5 x 5 mm, and can contain several million active components. They’re much more compact, require less materials, and use less power than printed circuit boards. That means they have a smaller footprint in just about every way, which besides making them more environmentally friendly is also useful in medical and military devices where SWaP (Size, Weight, and Power) reduction is a constant concern. Even the use of silicon is generally “green.” Its main environmental impact comes from its mining, which produces carbon monoxide as a by-product. Still, the total carbon footprint of all worldwide silicon manufacture is hardly significant compared to the amount of carbon released into the atmosphere as a result of the usage of fossil fuels. Sounds like ICs are the solution for any engineering project, right? They’re smaller, use less power, and allow you to pack tons of function into a tiny space. There’s just one problem – money. The trouble for companies with limited budgets is that IC design projects usually require making wafer lots with a very large amount of chips – the smallest test batches may contain tens of thousands of ICs. As one might expect, these kinds of projects can be very expensive, and the high cost can discourage companies with smaller budgets from turning to ICs and therefore being able to downsize their device and make it more environmentally friendly. 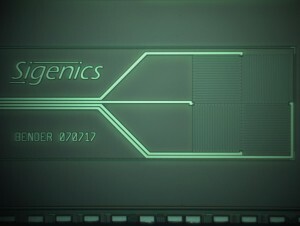 The beauty of what Sigenics has to offer is that we are able to make relatively small batches of ICs at prices that aren’t prohibitive to smaller companies, startups, and projects with limited budgets. Think of it as a sort of “boutique” chip design. Because of Sigenics’ ability to offer these smaller batches and lower prices, they’re able to help innovators make devices that run on less power, use less materials, and are generally more “green” – without losing too much gold, so to speak.